According to the latest asbestos disease figures released by HSE, 12,000 lung disease deaths each year are linked to past exposures at work! 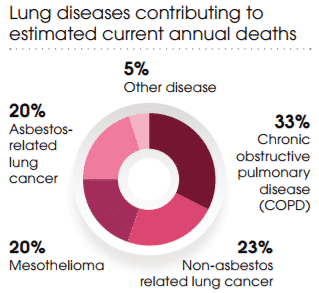 40% of lung disease-related deaths have been contributed to past exposure to asbestos. This is proof again that asbestos exposure is still the single largest industrial killer in the UK. The lastest mesothelioma figures reported, 2,542 Mesothelioma deaths in 2015. It’s estimated that a similar number of lung cancer deaths were also linked to past exposures to asbestos. These numbers are predicted to continue at around 2,500 deaths each year until 2020 at which point numbers are hoped to start declining. Occupational lung diseases typically have a long latency (they take a long time to develop following exposure to the agent that caused them). Therefore, current deaths reflect the effect of past working conditions. Mesothelioma related deaths continue to be the largest asbestos disease causing fatalities. This is over five times more than deaths related to asbestosis.